NATIONAL Sports Trust Ltd (NSTL) which manages all sporting venues under PNG Sports Foundation (PNGSF) has placed a blanket ban on PNG Football Association’s use of its Port Moresby facilities until all outstanding payments from the 2016 Fifa Under-20 Women’s World Cup are paid. NSTL chief operating officer David Aua said this when responding to a social media post by Southern Strikers franchise owner John Mogi who had stated that the ban on PNGFA was to do with soccer politics. However, Aua said there was no politics involved as NSTL was applying its user-pay policy. The NSL match between Southern Strikers and FC Momase was deferred to later date until NSL and NSTL could come to an agreement on the payments. 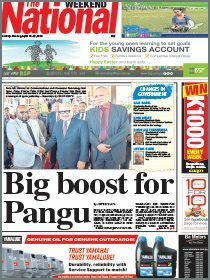 “This is a blanket ban for all PNGFA activities which include the National Soccer League,” Aua said. Aua said he knew that PNGFA and the NSL would claim that football politics was involved but he would not be drawn into that. Meanwhile, PNG Football Association senior vice-president John Wesley Gonjuan was disappointed that the NSTL did not approve NSL games at Bisini because of outstanding payments from PNGFA incurred during the U20 Women’s World Cup. Gonjuan said they were aware of the matter and informed NTSL that payment would be done once the auditing process was completed. “The financial report has been given to Fifa and is being audited by BDO accountants. NTSL is aware of the matter as well,” Gonjuan said. Gonjuan also said that franchises were also responsible for organising their venues in collaboration with PNGFA and the NSL board. “At first we were told that NSL could use Bisini but then late last week we were given notice that NSL would not be using Bisini until payments are done,” Gonjuan said. 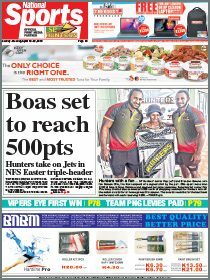 Gonjuan appealed to NTSL to work with the two Port Moresby-based franchises to help them use Bisini for their NSL games.